Driven and passionate, senior Jada Hallman is the Editor-in-Chief of The Zephyr and is looking forward to an exciting and eventful year. This is her fourth year as a part of the Zephyr staff and takes great pride in her extensive experience on the newspaper staff. In previous years, Hallman has advanced from a staff reporter to copy editor, and she plans to use her experience to assist her in leading the publication this year. As she assumes her latest promotion to a new leadership role, she is determined to execute her job with poise. Hallman lives in Tracy with her mother, father and two younger sisters. In her free time, she enjoys reading, practicing her writing, binge watching her latest favorite shows on Netflix and, astonishingly, studying. She prioritizes her education and aims to excel in all of her classes. Taking several AP classes, Hallman devotes a lot of her time to schoolwork and loves seeing her hard work pay off. Hallman’s favorite classes are Journalism and AP Psychology. Journalism allows Hallman to really step out of her shell and practice one of her many passions- writing- with a close group of peers. AP Psychology offers an entirely new perspective on life that really intrigues Hallman. 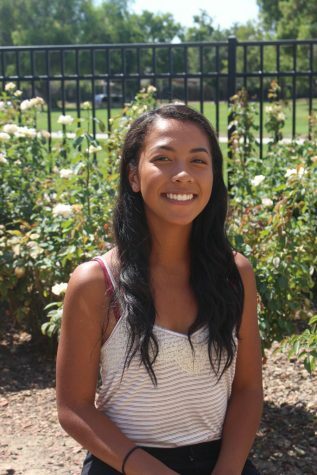 Hallman also is the President of CSF, Vice President of Project Smile and the Cross Country team captain. She thrives in positions of leadership and hopes to carry these experiences with her throughout college. Though she is still exploring her options, Hallman feels drawn toward Business Administration, Communications and Education majors in college and hopes that her new position as Editor-in-Chief of the newspaper this year will equip her with the skills she will need to continue down this path of leadership and professionalism. And with her work ethic, bright smile and compassionate heart, she will never fall short in her endeavors.